A bicycle is a fantastic, healthy way of getting from A to B. Whether you’re nipping around the city on a commuter bicycle, or going off-road on a serious mountain bike, there’s plenty of fun to be had on two wheels. Riding regularly can help keep you fit, and they’re far cheaper than cars or public transportation. If you’re a cyclist who also owns a dog, you might have considered ways you can involve your furry friend in your rides. Some dogs can be trained to run alongside a bike, keeping pace with you – but this can be tricky. 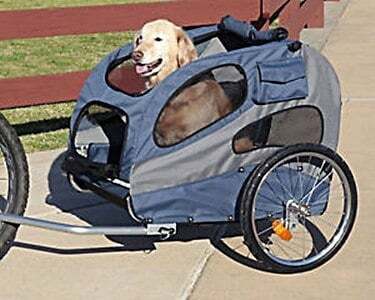 Fortunately, you can now buy bicycle dog carriers that allow you to keep your canine pal with you when you hit the road on two wheels. 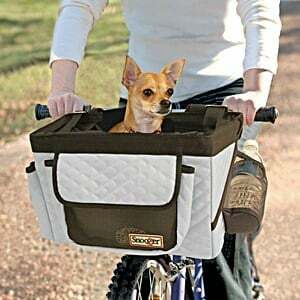 Bicycle dog carriers are a great solution for those who want their dog to accompany them on rides. It’s far safer than having the dog run alongside the bike. Some people choose to use doggy backpacks to transport their pets, but the extra weight on your back can throw you off balance. Dog carriers for bicycles are by far the best solution. 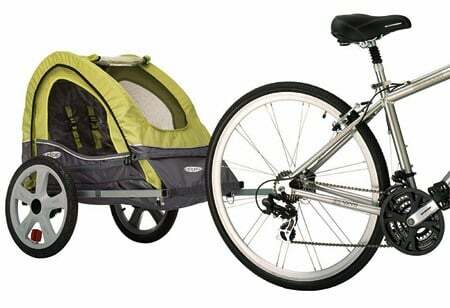 We’ll be looking at the advantages of dog carriers for bikes. We’ll examine the safest ways to use them and how to install them safely and securely. 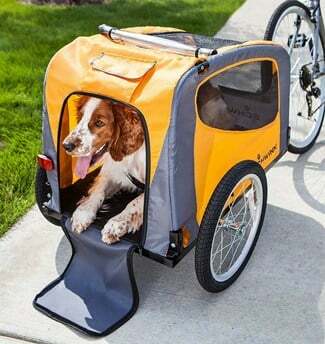 Of course, we’ll also look at some of the best bicycle dog carriers on the market, outlining their many features and advantages. Cycling is a fantastic activity for men and women of all ages. Some people use their bikes as their primary method of transport, while others use them purely for leisure activities at the weekend. Perhaps you’re someone who dresses in full cycling gear each week and tries to break their personal bests. Or maybe you’re someone who likes to take the whole family out for a bike ride at the weekend – even the dog. Cycling can be far less stressful than getting into a car or onto public transport with your dog. 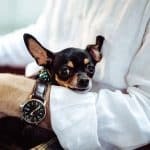 Many pets become anxious about traveling in cars, or on buses or trains. With a bike, you’re usually still going slowly enough for your pet to be able to relax. Cycling in cities can be a great way to get your dog from A to B quickly, without worrying about them getting under people’s feet on the busy streets or subways. Walking your dog to a local park or beauty spot can leave them tired before they even arrive. By cycling with them in a safe carrier, they can reserve their energy for a great playtime on arriving at their destination. Biking with your dog can be a great bonding experience for the two of you. Everyone knows how important it is to bond with your pets. So we’ve established that cycling with your dog can be a rewarding and enjoyable experience. Now let’s take a look at some of the equipment you’ll need to make that particular dream a reality. Firstly, dog carriers fall into two main categories. There are baskets for smaller dogs, which fit on the handlebars, and there are also trailers for larger dogs, which are pulled behind the bike. We’ll start with the baskets, which are ideal for small to medium-sized dogs, and even some cats who want to come along for the ride. 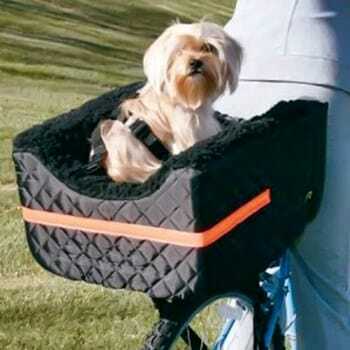 The Snoozer Bicycle Pet Basket is a small basket that fits right on the front of your bike. It buckles onto the handlebars and is suitable for mini and toy breeds of dog. Pets up to 14 pounds can fit into this pet basket with no problem whatsoever. You might be worried about how you’ll steer when there are an extra 15+ pounds attached to the front of your handlebars. The good news is that this pet basket spreads the weight evenly across the handlebars, so you barely notice the difference. You may need to go on a few short rides with your pet in the basket before you become accustomed to it. Aside from this, the basket shouldn’t affect your steering much at all. The Snoozer Bicycle Pet Basket has multiple storage pockets so that you can take extra accessories on every ride with you. Treats, toys and an extra leash are recommended for storage here. There’s also a rain cover in the side pocket of the pet basket, so your pup won’t get wet if the weather suddenly turns. The entire basket and the rain cover is made of durable microfiber fabric, which wipes clean easily. Inside the basket, your dog will be super-comfortable. There’s a removable inner pad (which is easy to clean), and a built-in chin rest, so your dog won’t need to sit up straight all the time. If you need to take off the pet basket for any reason, the entire thing packs flat, so it won’t take up lots of space in your home. Some customers have commented that their dogs have been well below the weight limit but were a little bit too long for the basket to be comfortable. If you have a dog breed that is renowned for being long (such as a Welsh Corgi or a Dachsund), you may want to consider a different type of basket. Most other small dog breeds will fit in the basket comfortably. This simple basket is another great solution for those with smaller dogs. It has an easy-to-use bracket system which allows you to clip the basket on and off your bike in seconds, with just one hand. It even comes with a small canopy so your dog will be protected from the sunshine and the rain. The Solvit Tagalong Pet Bicycle Basket was designed with convenience in mind. It has plenty of large zippered pockets so you won’t need to attach extra bags to your bike. These can be used for essentials like your purse, wallet or keys, as well as your dog leash, treats, and toys. The basket also comes with a shoulder strap, which allows you to convert the basket into a handy pet carrier at a moment’s notice. So if your dog has dozed off for a nap while you cycle and you don’t want to disturb them, you can simply clip on the shoulder strap and carry them around. At 16.5” x 10” x 13”, there’s plenty of room in the basket for most mini and toy breeds. Some customers have reported that heavier dogs (up to around 10 pounds) make it slightly harder to turn. Those with dogs that weigh around 5 or 6 pounds should have no trouble at all steering with the basket attached. Of course, having a larger dog sit on the handlebars of your bike is probably not going to be comfortable or safe for anyone! If you have a bigger breed of dog and would still like to take them out on the bike, a trailer is an ideal solution. The Solvit HoundAbout Pet Bicycle Trailer is a spacious, comfortable, and above all, safe way to transport your bigger dog with the help of your two wheels. The trailer has a universal bike hitch which can be attached to pretty much any bike on the market. There’s also the option to buy other hitches to improve compatibility. There are two types of trailer available – one with an aluminum frame and one with a steel frame. The aluminum is the newer of the two. It’s slightly lighter and just as strong as the steel option. This makes it ideal for those longer journeys when every pound of weight you’re carrying counts. The steel options are very hardwearing, and perhaps better suited to those who prefer durability over flexibility. Both the steel and aluminum frames have front and rear doors, so your dogs can hop in and out with relative ease. There’s a sunroof so your pet can catch some rays while you cycle and an adjustable safety leash within that keeps your dog secure while you ride. The front door has a zippered mesh screen layer and a vinyl windscreen layer to block out wind and rain if necessary. The entire thing is super easy to assemble and folds down completely so it can be stored when not in use. The only problems some customers have had with this bicycle trailer is when putting it together. Assembly can be tricky, but if you follow the accompanying instructions to the letter, you should have the trailer up in no time. Many dog baskets for bikes are designed to fit on the handlebars. But if you’re accustomed to cycling with pannier bags, you might feel more comfortable about carrying the extra weight on the back of the bike. This rear bicycle seat affixes to your pannier rack (not included) and provides a comfortable seat for your pet on any journey. The Snoozer Pet Rider Rear Bicycle Seat is suggested for pets up to around 24 pounds – so most small dogs will easily fit. The interior dimensions are 19” x 16” x 10”. Make sure you measure your pet and check they’ll have space to move around before you invest in this basket. The three-point safety strap means you won’t need to check behind you constantly. Your pet will remain secure while they’re inside the basket, which means you can concentrate on the road ahead. Cycling at night is also no problem – the reflective strip on the rear means other road users will always be able to see you and your dog. Lastly, the entire cover is removable and machine-washable. We know sometimes dogs like to go for a roll in the mud or a splash in the water. It’s great to have a removable liner that is easily washed so that you can keep your carrier in good condition for every ride. This trailer is also great for those who have medium to large dogs that wouldn’t fit in a bike basket. Though the trailer isn’t specifically built for pets (it can be used by small children too), it has plenty of great features that will ensure your dog is comfortable and safe on every journey. The simple hitch makes it easy to attach this trailer to almost any adult bike. It comes with 16-inch air-filled tires too, so you’ll be able to tackle some slightly rougher terrain without worrying about your passenger. The canopy doubles up as a bug screen and weather shield, so your dog will be protected from ticks as well as the elements. There’s an internal harness inside the InStep Sync Single Bicycle Trailer which makes safety a top priority. The maximum weight you should load into this trailer is 40 pounds, which covers most medium-sized dogs easily. Breeds like Beagles, Yorkshire Terriers, Shih Tzus, Maltese, and Pugs will fit comfortably with plenty of room to spare. This particular trailer comes with a rear doggy-door, which makes it easy for your pet to enter and exit the trailer when you’ve stopped. The unique folding frame of this model has also been built for convenience. The quick release wheels and folding components mean you can store this trailer easily in a car or your home. The Schwinn Rascal Pet Trailer is lined with a non-slip surface, so your pet won’t be skidding around inside the trailer. This liner can be removed and washed, which is perfect if your dog has been running around in muddy conditions. Like many pet trailers, the universal coupler means you can attach it to any bike. Whether you’re hitting the trails on a mountain bike or sticking to the sidewalks on your touring bike, this trailer will attach very easily. This trailer is ideal for those with larger dogs. It can accommodate pets up to 50 pounds, which covers most medium-sized dogs. Of course, you’ll need to bear in mind the extra pedal power needed to carry a 50-pound canine on your ride! You’ll also benefit from additional storage space which allows you to bring along bike tools, dog toys and your essentials without any extra baggage. Here are some important questions you’ll need to ask yourself before you commit to purchasing a dog carrier for your bike. Is your bike in good enough condition to take the extra weight? If you’ve not had your bike serviced for a while, it may not be safe to mount the dog carrier. You should also check your brakes before every journey – the extra weight means you may need to brake harder than usual. If your brake pads or cables are in bad condition, this could be dangerous. Are you competent enough to take the extra weight? If you’re new to cycling, adding the unpredictable weight of a dog to a bike can be dangerous. Dogs are prone to moving around, which can cause wobbles, which is not ideal if you’re on a busy road. You should ensure that you are a strong and confident cyclist before taking your dog out on a ride. What is the weight limit for the carrier? Will your dog fit safely? All bicycle dog carriers will come with a weight limit. If you overload the dog basket or trailer, it could become unsafe, not only for you but for your dog and other road users. If you have a puppy and aren’t sure of what their adult weight will be, buy a dog carrier with a much higher weight limit. What safety features does the carrier have? Is there a harness or safety belt inside for your dog? 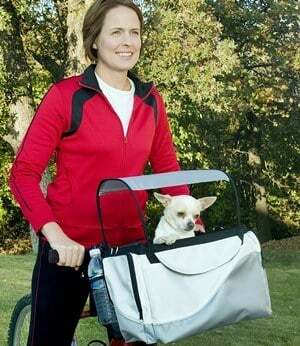 Does the basket come with a protective canopy so your dog won’t get sunburned? Does the carrier come with its own leash for your pet? Bringing your dog along on a bike ride is a fantastic way to bond with your pet and keep them close to you. Dogs can have immense fun sitting in their trailers or baskets watching the world go by! It’s also a great workout for you, the cyclist. The extra weight will put you through your paces and test your cycling skills. 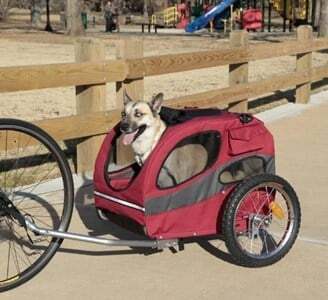 It’s vital to invest in the right equipment if you plan to cycle with your dog. Inappropriate baskets or trailers can be dangerous, not just for you, but for your furry friend. Make sure you choose the right trailer or basket for you and your dog and keep safety in mind at all times.